On Sunday, October 5, The Fun Conspiracy will launch its first annual Root Beer Float at the Asheville Outdoor Center on Amboy Road. Tickets are $34 for adults and $24 for children 12 and under. Tickets must be purchased in advance on The Fun Conspiracy website. Space is limited to 24 participants. A portion of Root Beer Float ticket sales will benefit Asheville GreenWorks. The Fun Conspiracy’s first annual Root Beer Float will provide individuals, families and those in recovery with an opportunity to explore the river and socialize while engaging in un-adulterated fun. “We are blessed to have such a vibrant river community here in Asheville,” shares Ginny Hunneke, The Fun Conspiracy’s founder. After the float, participants are encouraged to stay and enjoy a root beer float or ice cream treat and AOC’s facilities which include a volleyball sand court, ping pong tables, a playground, outdoor stage and picnic tables. Participants will meet at 12:15 pm at the Asheville Outdoor Center on Amboy Road, where transportation will be provided to the Bent Creek put in. 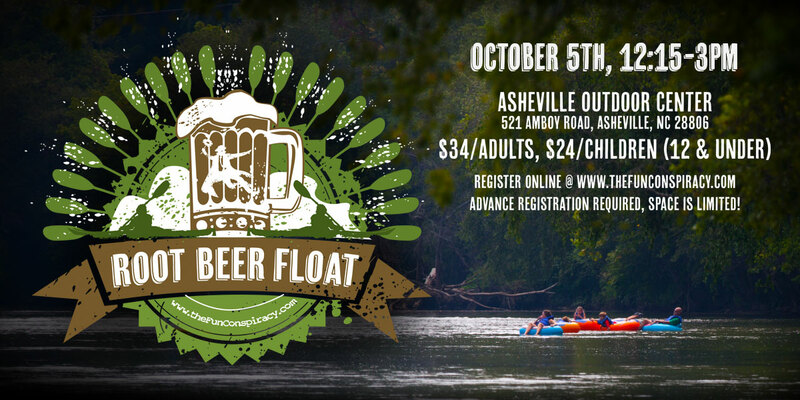 For more information and to register, visit http://thefunconspiracy.com/root-beer-river-float-october-5th. The Fun Conspiracy offers one-on-one and group life coaching, playshops and retreats for individuals and organizations, and community wellness events that are designed to cultivate opportunities for liberating joy in a safe, substance-free environment. More information at www.thefunconspiracy.com.